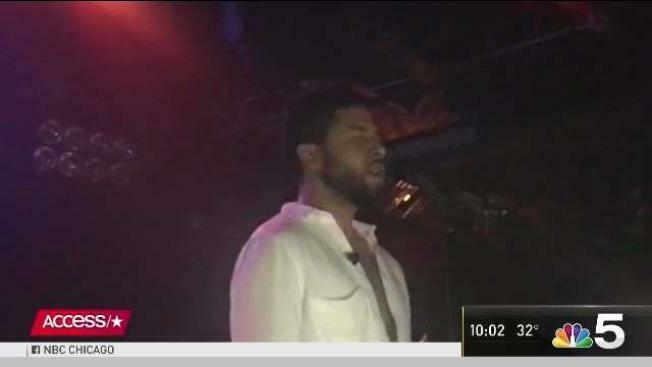 The police report states that Smollett's injuries were minor and he was "bruised"
"Empire" star Jussie Smollett, who told police he was attacked last month in Chicago, did not want to report the incident but was convinced it was "in the best interest" to do so, according to a police report obtained by NBC 5. Smollett told police on Jan. 29 that two masked men punched him, subjected him to racist and homophobic insults, threw an "unknown chemical substance" on him and put a thin rope around his neck before fleeing. The alleged attack occurred in the 300 block of East Lower North Water Street about 2 a.m., according to the police report. It's unclear why the television star was hesitant to report the alleged attack, but the person who did call it in -- whose name is redacted in the document but who police have said was Smollett's manager -- convinced the actor to do so. That person also requested the officers turn off their body-worn cameras, according to the police report. The report also states that Smollett's injuries were minor and he was "bruised." Under "weapon used" section of the document, it reads "Hand/Feet/Teeth/Etc." Smollett recently thanked fans for their support and addressed "inaccuracies and misrepresentations" about what he called a "cowardly" attack on him in downtown Chicago in a statement to NBC News. “Let me start by saying that I’m OK,” Smollett wrote. “My body is strong but my soul is stronger. More importantly I want to say thank you. The outpouring of love and support from my village has meant more than I will ever be able to truly put into words." 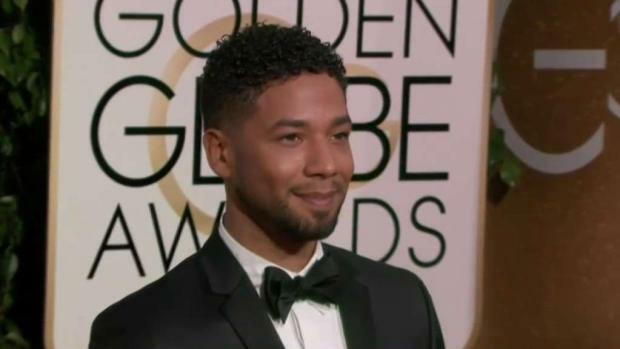 Smollett, who plays the gay character Jamal Lyon on the hit Fox television show, said he was "working with authorities and have been 100% factual and consistent on every level. Despite my frustrations and deep concern with certain inaccuracies and misrepresentations that have been spread, I still believe that justice will be served. According to the police report, Smollett said his attackers identified him with racist and homophobic names and also referred to his affiliation with the show "Empire." Both attackers were dressed in all black and one was wearing a black mask, the police report stated. Smollett's family issued a statement through a spokesman last week saying they believe he was the victim of an unprovoked "racial and homophobic hate crime" and that he has been forthright with the police, who are still searching for surveillance video of the attack. Smollett's manager called police about 40 minutes after he got home, police spokesman Anthony Guglielmi said. When officers arrived, the actor had cuts and scrapes on his face and the rope around his neck. Smollett later went to a hospital for treatment. Smollett's family thanked the public "for their prayers" and said they are "so grateful that God saw him through this cowardly attack alive." "We want people to understand these targeted hate crimes are happening to our sisters, brothers and our gender non-conforming siblings, many who reside within the intersection of multiple identities, on a monthly, weekly, and sometimes even daily basis all across our country," the family said. "Oftentimes ending fatally, these are inhumane acts of domestic terrorism and they should be treated as such." They said such incidents will continue to happen until people are held accountable. Detectives have recovered surveillance footage of Smollett walking home from a Subway restaurant that morning, including video of him arriving at his apartment building with a rope around his neck, said police spokesman Anthony Guglielmi. The area is home to many high-end hotels and restaurants and has hundreds of cameras, so there are still many more videos for investigators to collect and go through as they try to get a complete picture of Smollett's walk home, Guglielmi said. It is tedious work that is made more difficult because the time stamps on various cameras may not be in sync, meaning detectives have to figure out the exact times of events, he said. Reports of the attack drew a flood of outrage and support for Smollett on social media. Some of the outrage stemmed from Smollett's account to detectives that his attackers yelled that he was in "MAGA country," an apparent reference to the Trump campaign's "Make America Great Again" slogan that some critics of the president have decried as racist and discriminatory. Jussie Smollett was attacked in Chicago by two men who yelled racial and homophobic slurs as they beat him with their fists and tied a rope around his neck. Kim Baldonado reports for the NBC4 News at 5 p.m. on Tuesday, Jan. 29, 2019. "That I can tell you is horrible. It doesn't get worse," the president told reporters when asked about the matter. The spot where Smollett says he was attacked isn't far from the Trump International Hotel & Tower. Now in its fifth season, the hour-long drama "Empire" follows an African-American family as they navigate the ups and downs of the record industry. Smollett's character is the middle son of Empire Entertainment founder Lucious Lyon and Cookie Lyon, played by Terrence Howard and Taraji P. Henson, respectively.